Confusion Is Nothing New (Hardcover) | Let's Play Books! Ellie Magari just learned that her mother is dead. Perhaps that would be sad if Ellie had ever met the woman. Exactly who was Ellie's mom? Does it even matter that she's gone? Perhaps a dead mom can still help Ellie figure out what it means to be a girl in the world today. Either way, Ellie wouldn't mind a role model beyond her master chef Dad. 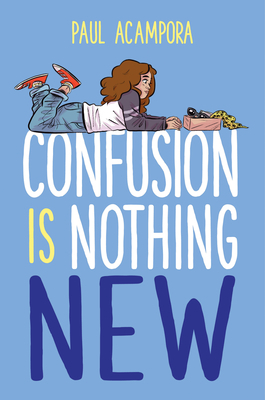 Fueled by the bighearted sounds of '80s rock and roll, plus large doses of Cyndi Lauper's girl-power joy, Confusion Is Nothing New is about friendship, family mysteries, and the perfect pizza. It's also about fathers and daughters and girls who understand that it's good to make things, but breaking things is okay too. In fact, sometimes breaking things is required. Paul Acampora has written three novels and people have said nice things about each of them. Kids, parents, and critics praise his work for its laugh-out-loud humor, rollicking dialogue, and heartfelt characters. He is the author of Defining Dulcie, which School Library Journal called "an inextricable mix of sadness and humor, sorrow and hope"; and Rachel Spinelli Punched Me in the Face, which Kirkus Reviews described as "an outstanding, humane coming-of-age tale of loss, yearning and forgiveness," and I Kill the Mockingbird which, according to Booklist, is "[a] well-written, resolutely cheerful offering [which] celebrates books, reading, and life." You can find Paul online at paulacampora.com.